We were looking at what happens when your airline goes bust for last week's Finance Fridays. This week we are talking about something that is on the increase – the use of students in money laundering. When your children go away to university there's lots of advice you can give them and steering clear of money making scams like this is one to warn them about. The high jinks of Freshers' Week might be over for university students and now is the time to knuckle down to do some hard work. As we all know going to university is very expensive from the course fees, accommodation, daily living expenses plus course materials. When funds are low it's easier to fall into the trap of making some money quick and easily without questioning where it is coming from. Where does the stolen money come from? - Usually from criminal gangs who have posed as solicitors, builders, financial advisers and car sellers. They intercept email exchanges between real buyers and sellers in order to tell the people who are sending the money that it needs to be sent to an alternative bank account. Other criminal activities include bank account hacking and credit card fraud. They choose transactions which will run into thousands of pounds. What happens to the stolen money? - In order to 'clean' it they need to move it away from the original bank accounts that the money was put in to. This is then transferred on again so it looks like it is from a legitimate source and the money has now been laundered. How do they find people? - Through social media posts on Facebook, Twitter, Instagram and other channels. They can advertise roles such as 'money transfer agents', 'payment processing agents' or 'administration assistants'. When it comes to these 'jobs' the payment for sending money through your own account could be a set fee or a percentage of the amount moved. There will also be other people hanging around on campus befriending people in person. Due to the large amounts of money involved the criminals can build a relationship up over a number of months before making the big transaction. At first it could be small sums of money that are passed through your account before they have fully gained your trust. It's not unusual for students to have problems with their own bank accounts so they ask a 'friend' to help them out. In these circumstances the 'money mule' probably won't benefit financially as they are thinking they are doing a friend a favour. Why use students? - They are young, vulnerable, away from home from the first time and in need of the cash. According to the Credit Industry Fraud Avoidance Scheme (Cifas) last year there were 8,652 cases of people aged 18-24 who acted as 'money mules' for criminal activities. 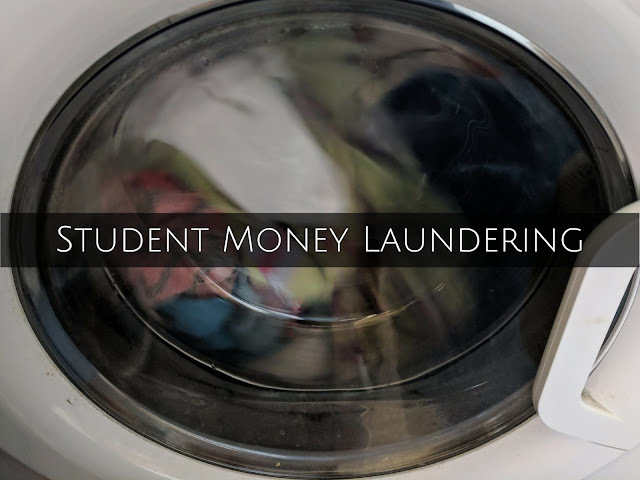 As the money is often shifted to overseas accounts they take advantage of the fact that universities have a large numbers of international students so it may not seem strange to be asked to send money abroad. How do they get caught? - Banks have now become alert to suspicious transactions going through bank accounts. If regular sums of money are being sent to different accounts abroad or a particularly large sum has come into the account and then shortly transferred on the bank can freeze the account. It may then choose to contact the police about it. It will then be up to the account holder to try and prove their innocence. This type of offence is illegal under the Proceeds of Crime Act and can carry a sentence of up to 14 years plus of course a criminal record. What can I do to stop this? - Whether student or not never allow anyone to use your bank account to pass or send money through. Even people you have known for years could be part of a bigger chain. If you want to join in with this week's Finance Fridays then add your link to the linky below. Any post concerning financial matters is allowed. Full details here. It doesn't have to be published today as you have until 23.55 on Tuesday 16th October 2018 to join in.